Oh my, oh my, oh my, I am in finished-sweater heaven. 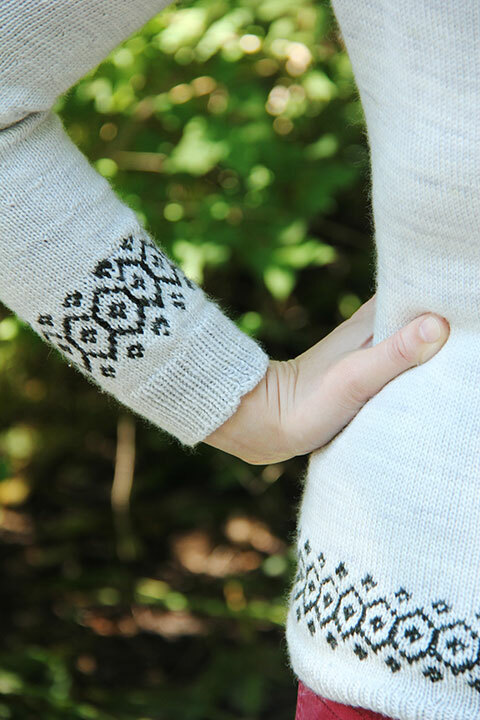 I actually finished Stasis last weekend, but it has taken me a week to get proper photos (of course, the week after I finish a sweater has the warmest weather we’ve had in ages — not that I’m complaining: I loved it). 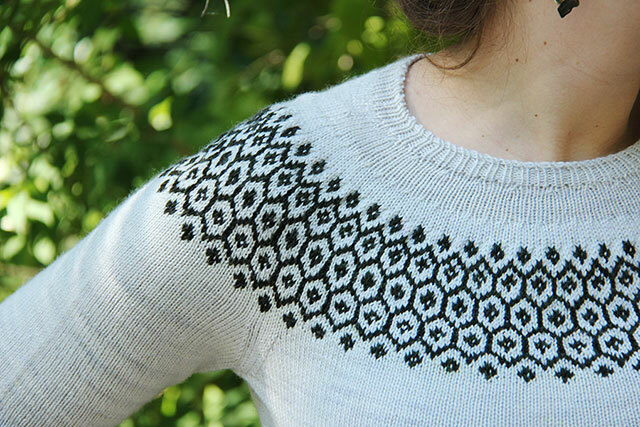 This was my Summer-Sweater KAL project this year (last year’s was Burrard — I can’t believe that was a year ago), and I am so glad that Shannon hosted the sskal again because it inspired me to pull out Stasis, which I’d started in February, and get it done. The pattern recommends knitting the sleeves first, so that’s where I started in the winter (I finished the colourwork portion on each and got maybe an inch further before putting them down). I knit each sleeve separately through the ribbing and colourwork, and then knit them two-at-a-time until they were about 18 inches long, at which point I put them aside and cast on for the body. A little blown-out, but you get the idea. I pretty quickly realized that the tubular cast-on I used for the sleeves wasn’t going to work for the body. I had used Ysolda’s technique, which I really like (so quick! ), but there were too many body stitches to keep under control. I did some Googling and found this method, which worked very well indeed, and is absolutely identical. After that it was pretty much smooth sailing up to the yoke (my only mod was to add about an inch to the length). Although the yarn was pretty evenly dyed, I alternated skeins every two (or three) rows after the bottom colourwork, just to keep the colours blended. Everything basically went fine until the yoke decrease portion. I read lots of project notes, many of which said they’d had to shorter the yoke section, so I knew it might be a problem area. I was getting row gauge, though, which seemed like such magic I assumed that I’d be okay, especially since I’d knit every other part of the pattern as written and it was turning out beautifully. I knit and knit and knit, and worked the ribbing and worked the tubular bind-off, and put it on and did not like it. It was wearable, don’t get me wrong, but the ribbing sat up on my neck like a mock turtleneck, and the yoke sat low around my shoulders, which made it feel strangely like it was falling off. It also made the armpits feel saggy and the arms too long, and I knew that if I left it it would never be a sweater I reached for. Looking at the way it fit, it seemed to me that I needed to be starting the collar ribbing more-or-less where the second decrease round was, and also that I needed to do fewer (and wider) short-rows across the back neck. I used the needle end on my trusty plastic stitch-holder thing (no affiliate, so click away) and wove it through the right leg of each stitch in the row approximately five rows above the colourwork. Then I ripped without fear of going too far. I knit one row, to get everything even, and then worked decrease row 2, then knit five plain rows before starting the short rows. To make those work better, I used the numbers for the size up, and only knit four sets. After that I finished as written. Even a freshly-blocked sweater manages to collect cat hair around here. Thanks for that, Ganymede. The result is exactly what I was hoping for. It’s a fitted sweater, but still with plenty of space for layering once the weather gets cold. The yarn is soft enough that I can wear this with just a tank top underneath, and the main colour is a subtly variegated grey/white, which looks really nice over the all the plain stockinette. Now I have a reason to not bemoan the advent of cold weather — it was in the low-20s (high-60s) today when we took these and we had to seek out shade so I didn’t sweat too much! Mods: I pretty much went over all of this, but to sum up: I added length to the body (about an inch) and then fussed around with the yoke until I was happy. 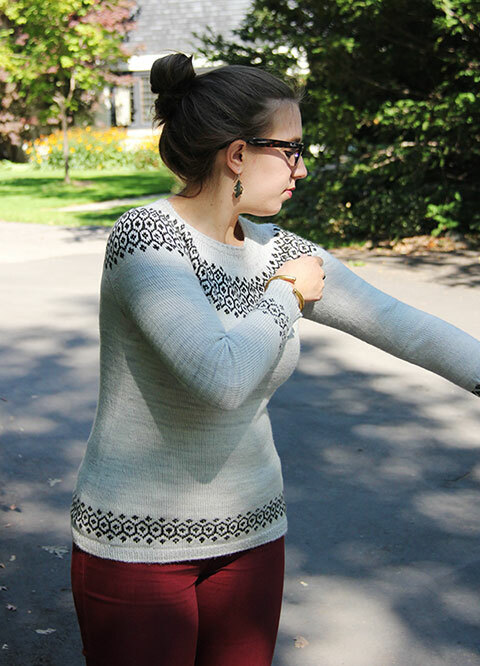 Other than that, I knit the sleeves two-at-a-time (the first time I’ve ever tried that!) and, since I forgot the colourwork gauge needle when I went away last week, I just said to hell with it and knit the yoke entirely with the main gauge needle. It’s more fitted I guess, but I think it’s okay. I let the floats run a little long just to make sure it didn’t get tight. Ravelled here. Let me leave you with one of L’s test shots. It’s a weird angle, but I like that it’s sort of an action shot. wow, this is really beautiful. The yoke part sounds rather intimidating but now it looks perfect. So gorgeous! Thanks for joining in! Thank you so much for hosting! Goodness knows I wouldn’t have finished yet if it hadn’t been for the KAL. Beautiful! It’s definitely a sweater to be proud of! I love this so much, Angela! I think it’s great that you trusted yourself to modify the yoke. I haven’t knit many sweaters like this and so that would definitely give me pause. I will keep your mods and alternate cast on link in mind for the future. Thanks, Michelle! Like so many knitting things, the mods I made to the yoke are harder to explain than to actually do. That fits you so well, and looks amazing with the red pants! Thank you! I love that coloured jeans are back in style. Oh my, it’s absolutely gorgeous, congrats! !